Missouri U.S. Senator Claire McCaskill has offered her view on several of President Donald Trump cabinet choices. The Democrat, who is up for reelection next year, is being scrutinized in a state that voted for the Republican commander-in-chief by a 19 point margin. She faces the balancing challenge of not angering Trump supporters who may have voted for her in the 2012 election while still satisfying her Democratic base. McCaskill released a statement last Friday announcing praise for Generals’ John Kelly was James Mattis, both of whom she voted to confirm. Both were affirmed the same day; Kelly as Secretary of Homeland Security and Mattis as Secretary of Defense. McCaskill appeared to be massaging support from the state’s electorate which voted for Trump in the release. “When it comes to well-qualified nominees charged with protecting America’s security interests at home and abroad party labels shouldn’t get in the way of good public service” said McCaskill. 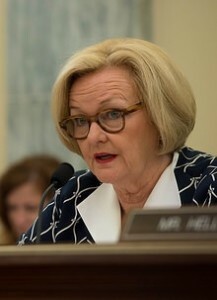 McCaskill is the top-ranking Democrat on the Senate Homeland Security Committee. A number of groups are pressuring Senate Democrats, including her, over how to vote on Trump’s cabinet picks. The NAACP has been lobbying McCaskill and other Democrats who face reelection next year to vote against Jeff Sessions, Trump pick for Attorney General. McCaskill says she hasn’t decided whether or not she’ll support him, but is troubled by his voting record. During the MSNBC interview she said, based on that record, she’s concerned over decisions Sessions might make as the nation’s chief prosecutor. Senate Democrats are also being contacted by teachers’ unions to oppose Trump’s pick of Betsy DeVos as Education Secretary. While on MSNBC, McCaskill confirmed her opposition to DeVos, stating that the Michigan billionaire failed to demonstrate basic understanding of education laws and standards during her confirmation hearing last week. McCaskill also said she’ll vote against Oklahoma Attorney General Scott Pruitt to head the Environmental Protection Agency. Rajiv Ravulapati with the Missouri Chapter of the Sierra Club stated his organization will trumpet her vote and is looking into sending McCaskill a thank you note. One prominent Missouri political science professor doesn’t think McCaskill’s cabinet votes will play a major role in her chances at reelection. Terry Smith of Columbia College says her votes on Trump’s nominee for the Supreme Court vacancy and on major legislation, such as Obamacare will be much more consequential.